Boom or inflation in Malaysia? Posted on 2/7/2013, 10:29 pm, by Colin Charles, under Malaysia. Is the Malaysian economy experiencing a boom or is the economy experiencing inflation? All the Maybank ATM’s I’ve visited recently have begun dispensing RM100 and RM20 notes as opposed to RM50 and RM10. Posted on 28/10/2009, 11:36 pm, by Colin Charles, under General. I see you’ve decided that it would be wise to charge a RM50/year credit card tax, on a per card basis, while charging the supplementary users RM25/year. Your opposition says that you will thus make RM400 million a year in revenue, just from these fees alone. Some are however convinced, that though you slap a tax on us credit card users, most banks will probably absorb the charges to hold on to customers. But you don’t like it, because the tax, is meant to promote prudent spending. First up, the rakyat aren’t stupid. Please do not think you’re smarter than them. Telling the rakyat for example, that the EPF is the be all and end all, is just silly. Telling them that they need at most “two cards”, is no better, my friend. Limiting credit card transactions, harm the economy. As more and more people are getting broadband Internet access, more and more people are choosing to purchase online. Today, you can buy air tickets, groceries, cameras, services and clothes online, all thanks to a credit card. By imposing a fee, you are potentially harming the online economy, and this is not in tandem with the MSC, at all. Credit card companies like to reward their cardholders. HSBC for example, regularly rewards you in the MidValley and Gardens shopping malls. CIMB is currently rewarding shoppers at Pavillion. American Express regularly has some dining places on its rewards list. These lists go on for many banks, including Citibank, UOB, etc. These are 10-20% discounts, which mean a lot to the average Malaysian. This encourages you to carry more than one credit card. If I may be allowed to put on my kiasu hat again, I’d like to say, this is exactly what I do. I patronise places, where I know I can get a discount. Or where I know, that if I spend RM50 on food, I get a free dessert valued at RM15. I want my ringgit to go further, and I’m sure the rest of my Malaysian friends do, too. Today, I almost always exclusively buy coffee at Starbucks with a credit card, because everything I sign off, is 10% cheaper. Credit card companies like Citibank tell me that they’d like to slap me with an RM600 yearly fee for my credit card. I got off a plane, and at about 2.30am, I called their call centre, and told them I’d like a waiver. They did just that. Do you honestly think they’d like to charge me RM50, when they’d just waived RM600? HSBC tells me I get my Visa Platinum and Gold MasterCard, free for life. I have a hefty limit on the Visa Platinum, and almost never use the Gold MasterCard (not many places today only accept MasterCard, thankfully). Do you think I will be cancelling it if I’m slapped with an RM50 fee for something I almost never use? Public Bank likes to give me credit cards that are free too. To boot, they give me a 0.7% rebate for every ringgit spent. Now, remember, I am kiasu, and I like seeing my rebates. Would you honestly think I want to spend RM50 of it, on fees? (make that RM100/year, for both Visa and MasterCard). Quick math tells me that I’ll have to spend nearly RM15,000 just to get my cash back, to pay the government. Incidentally, a lot of banks throw credit cards against those that hold a loan at their bank. They are free of fees. Should they also now be slapped with an RM50 fee? I lived in Australia for many years. There, you can pay for everything, from a 5-dollar latte to a 100-dollar taxi ride, using your bank card, via EFTPOS (Electronic Funds Transfer at Point Of Sale). There are lofty goals with MEPS in Malaysia, but its just not widely used. However, credit cards are widely used and available. No, I still can’t pay for a taxi ride, and we’re very far behind in comparison to Australia, or our little neighbour down south, Singapore, but at least, we’re getting there. Charging fees will probably hamper the use of electronic transactions. I have a dream, that when I go to a mamak stall, and order myself a roti telur (double telur! 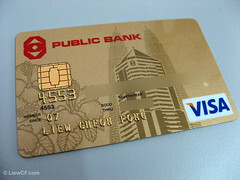 ), and a teh tarik, I can use my credit (or debit) card, and pay for it. Malaysia has always aimed to be a modern society, and if we can go cashless, we’ll be safer. Crime in Malaysia is already so high, and the last thing we need, is further encouragement from the government, for people to deal in cash transactions. The more we can move to electronic transactions, the better. Today, the average Malaysian probably buys a lot of things on these wonderful “easy payment schemes”. You take the item home, and pay for it, with 0% interest, over a period of 12-24 months. This is how people get a snazzy television, a new laptop, or a massage chair. Having less credit cards in circulation, means people potentially buy less stuff. Are you not hampering the economy, this way, as well? As a frequent traveller, I can for one tell you, that the Malaysian Ringgit, is not worth very much. 1 Euro is about RM5, and 1 USD is about RM3.50. Visiting Australia, sets it at 1 AUD being about RM3, while just going down south to Singapore, 1 SGD is about RM2.50. We had a 1:1 currency with Singapore, not long ago, but this “basket peg”, has really undervalued our currency. Travellers need more credit cards, plain and simple. What are the other options? Carry a boat load of cash, and lose it at a tourist spot? Travellers cheques, are going out of fashion, like you wouldn’t believe. And the glorious Malaysian ATM cards stop working from midnight-6am Malaysian time (yes, you have to time your withdrawals overseas). And that 6-digit PIN number, tends to not work, in countries where PINs are 4-digits long. Don’t assume the rakyat to be dumb. They can plan for themselves. Start an advertising campaign. A Flickr user, Liyin, can help. That image is off to a good start (not CC licensed unfortunately). Don’t assume the lenders (banks) to be dumb, either. This isn’t America, and the banking regulations are a lot stricter. Credit cards usually give you a 2-3x salary limit. They ask for papers (salary slips). The banks know how much debt you can handle. Wouldn’t it be better to impose on banks to say, “no to 3x salary, but 2x salary”? I want to see online transactions take off. And the solution is not online bank transfers (RM2 GIRO fee applies). Its credit cards. Please don’t hurt the rakyat from spending. Photo credit: LiewCF on Flickr. Posted on 6/5/2009, 6:09 am, by Colin Charles, under General. The good news – the website to track economic stimulus funds in Malaysia is now ready. Check out: Rangsangan Ekonomi Malaysia. Even better news, they used an open source software solution (Joomla!) to make that website happen. So mad props go out to them. Only thing that irks me? Its all in Bahasa Malaysia, with no translation in English. Posted on 15/4/2009, 10:47 am, by Colin Charles, under Travel. My trek to the USA this time around, was mired with issues. First up, I was flying a new airline – Cathay Pacific. I had generally flown United or Singapore Airlines to the States, because it just seems to work better — plus they’re Star Alliance, and I like keeping my status there. So, I now register for their Asia Miles. My travel agent (the venerable AMEX travel) tell me that the flight they booked me, the seats can’t be pre-booked, so I’ll have to wing it at the airport. Nifty. Thankfully, I get an aisle seat. Now, as soon as I get on the plane from Hong Kong to San Francisco (delayed, might I add, by a few hours — where’s my compensation, oh wait, AMEX booked the flight, I can’t ask my credit card company for money now), I get a tad shocked. I have an aisle seat towards the back of the plane. The seats don’t recline. OK, they do, but they are a new design, and they recline inwards. This means that if you carry any height, you’re screwed. Sure this means no one ever gets towards your laptop screen, as they can’t recline backwards, but is this really what I want on a long haul flight? OK, the seats have in-flight power. There are nice screens, and the in-flight entertainment is great. All this reminds me of Singapore Airlines (in fact, SIA’s flights to SFO via HKG/ICN still sometimes tend to not have power, unless you fly the new Airbus). Heck, the whiskey they serve on-board is great – Chivas Regal 12yo, and Johnnie Walker Black Label (not the Red Label crap you tend to get) — pity I don’t drink in-flight. But the seats not reclining? Apparently, I’m not the only one who has encountered this: Cathay Pacific’s New Coach Seats (I’d focus on the comments, if I were you – and yes, I too am 180cm tall, just shy of 6-feet), Economy class seat comfort review (hardest seat, bad for lower back, “seats were the worst”), and the list goes on. No one seems to want to fly Cathay on a repeated basis, on long haul flights. Don’t believe their marketing hype. SeatGuru doesn’t have much info on the best seat to snag either — because there is no best seat. So, I have to fly Cathay back again from the US soon. But let it be known that this is the last time I will fly them on a long haul flight. I don’t care if you can shave a couple hundred bucks off, I was useless and not at my optimum for two days since arriving, and I’m sure the productivity lost, outweighs the cost of the savings in the ticket.